Quick MTF - Software for measuring lens and image quality factors. Uses the slanted-edge measurement technique for discrete sampled systems, as described in ISO 12233. 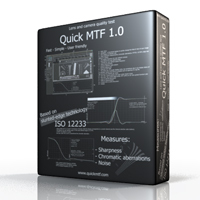 Quick MTF is a high-performance software designed for measuring the most important lens and image quality factors. With Quick MTF you can make the best choice, when you want to invest wisely in a new lens, camera or scanner. To estimate your target device with Quick MTF, you just need a picture of a simple object taken with it. Quick MTF uses the slanted-edge measurement technique for discrete sampled systems, as described in ISO 12233. The result of long-term development, Quick MTF combines an intuitive user interface with the most precise and powerful computation engine. It does not require any additional external components or libraries. PaddleMaster - Pinball simulation, you collect points with a ball. The program offers realistic physics like the arcade machines, several levels of difficulty, controllable objects, light & shadow calculation, edge-antialiasing and many maps for long fun gameplay. iRAPP - This application lets you mix your favorite PC & Mac applications in your own way. KinderGarten - A fun-filled, colorful and interactive management game where you play Mila, the kindergarten owner! You have to help Mila take care of the babies that get dropped off by their mommies! Are you ready for this baby-driven challenge? EasyClone 2008 - Clone / Copy your entire Hard Drive to another, Backup Windows, Mac OS, Linux, Unix, programs as well as personal files. Reminder Commander - The progeamm will help you create a system of reminders for important events such as birthdays, anniversaries, appointments, important phone calls and much more. File Scavenger - Recover data accidentally deleted, removed from the Recycle Bin or from corrupted, deleted or reformatted hard drive/flash memory card. Moyea PPT to DVD Burner - A powerful tool to convert PPT to DVD or video. It can not only retain the source PPT file, but also customize output settings.